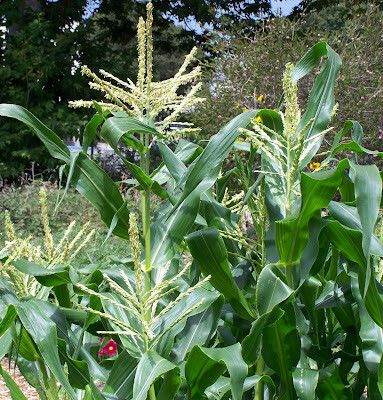 Corn standing tall in the garden promises good eating right around the corner. As a boy in Kansas, I knew my grandfather's goal every year was to harvest sweet ears by July 4th. He and his neighbors might bet hard earned money on who would harvest their crop first. Most years he was the surely the winner! Since corn takes a lot of room, many Los Angelenos will need to purchase this treat at their local farmers' markets. July brings hot weather. Finally. Now is the time to get a cool drink and say hello to summer in our Southern California gardens. For this reason alone, I insist that no garden should be created without seating for the gardener to glory in the work that has been done. This is not the month to do a lot of planting, if you can help it at all. Water is what your garden wants along with some weeding and harvesting. Don’t just pour water on your garden without exercising your noggin! Monitor the soil moisture and apply water as needed – but before plants begin to wilt. Try to water when less will be lost to evaporation – early in the day or late in the day, even under the full moon, listening to the owls. Stick a finger in the soil up to the first knuckle. Better yet, turn over a small spot of soil with your trowel. It should be slightly moist down about an inch or so. The surface of the soil can be quite dry and that's fine. A gardener is more concerned with the moisture level in that part of the soil where roots live. It is most important to have water at the roots of plants – spraying water into the air to fall on the soil, is not very efficient. A lot of that water can be blown away from your plants (on to the neighbors!) and a lot evaporates off into the air. It is not very efficient at all. But there are other ways to to water that are better. All these other ways involve putting the water close to the root zone. The two ways to do this include some of the newest technology and some of the oldest technology. The newest technology is drip irrigation; the oldest is called an 'olla' – pronounces OYE-ya. Variations of ollas are found in several different ancient cultures and there is a move to put them back into gardens today. But before we get to that, we need to know some things about water and how it moves in the soil. First of all, water 'sticks' to itself. If you over fill a glass of water to where it is actually higher than the edge of the glass, it often can hold together and not run down the side of the glass. The tendency of water to stick together is one of the qualities that make water so valuable a part of our world. So as water moves, it pulls other water along behind it. Water moves down in the soil because of gravity. Water moves up and out of the soil into the atmosphere because of evaporation. Water moves sideways in the soil when pulled along by plant roots pulling water molecules out of the soil, which drags other molecules along behind. Water fans out from the point it drips into the soil to a more narrow or wider 'fan' depending on the composition of the soil; sandy soil, with it's large pore space allows the water to move more downward than outward. Clay soil, on the other hand, with small particles tightly packed causes water to expand outward much more dramatically than sandy soil. Now, on to getting water to your plants' roots! Drip irrigation has gotten a lot of attention over the last twenty years. A number of people who have played with drip, myself included, have come to feel it is less than 'as advertised.' In the first place, drip irrigation is a lot of plastic parts. Compared to an underground irrigation system that are very expensive and difficult to install, drip systems are cheap and easy! But on the other hand, that means they are also relatively impermanent. Plastic can be easily broken – and therein lies the tale of drip. The plastic seems to develop a magnetic attraction for shovels and other sharp instruments, which means it must be repaired constantly. Wild animals also find the plastic tubing an easy source for water – just make the hole a little larger and there is another repair awaiting your attention. Anyone who depends on a drip system, soon learns to observe the entire system while it's running at least once a month. The observation, done more with one's ears than one's because you can hear the water making noises that it would not make if the system was still working properly. Furthermore, the pattern of wetness in the soil made by drip is not ideal for a number of plants. Plants did not evolve to gather water from a single spot with no water before or after that spot. For some plants, this is a problem – especially the 'drought-resistant' plants. Part of their strategy is to find water over a much wider range than less drought tolerant plants. As a consequence for a lot of the drought resistant plants, drip irrigation is a problem more than a solution. This is particularly difficult for the California Native plant palette than it is for plants that have been in the care of humans over the past hundreds of years. California Native plants tend to not do so well with drip irrigation. Finally, every replanting of a food crop, requires the drip lines to be rolled up to facilitate preparing the bed and planting. This is a cumbersome project at best and is a disaster for the drip system at worst. Drip has a lot of drawbacks although it does deliver water to the roots with relatively little loss of water to the atmosphere and does reduce water waste. There is one other recent change that updates drip to what is called a 'leaky pipe or hose.' This technology has most of the good qualities of drip but is easier to deal with and the leaky hose sweats water all along its length which means there is a zone of wetness in the soil, more closely approximating natural conditions and the hose is less of a hassle to repair or move. It's not perfect but this is a reasonable choice for non-permanent plantings. Ollas on the other hand, are a lot more permanent and are not made of plastic. Made of clay, an olla (Spanish for 'pot,' as in 'soup pot.' ) is porous and water 'leaks' out. The olla is buried in the soil, filled with water which then seeps into the soil, spreading out into the soil to water nearby plants. How far the water moves in the soil is different according to the soil's composition, and is not clearly understood at this time, but one can make some educated guesses in short order. Ollas are not a good candidate for trees and perennials with woody roots. They are also somewhat fragile, but not as much as drip parts and they are not made from oil like plastic. Ollas do not have to be moved to plant a bed, as long as you are not tilling the soil in any way, and, of course, in my style of gardening, that isn't done. Ollas are fabulous in planted containers. But do take steps to find ways to control the amount of water that is put in your garden – and no matter how you get water to the roots, make sure you mulch the beds thoroughly and save the water you do put down from evaporating off into the atmosphere. Check the mulch level this month; insure it is deep enough to keep roots cool and prevent evaporation of the precious water you are putting down. I don't use fertilizer, which means my plants are never over-fertilized and with the constant use of compost and mulch, they are well supplied with all they really need to thrive. I am cautious about using really good compost that might have a lot of nitrogen in it on tomatoes. They tend to use up all the nitrogen you give them by growing very large and healthy-looking plants and not setting fruit. For our climate, this isn't a disaster, you just have fresh tomatoes in September and October. 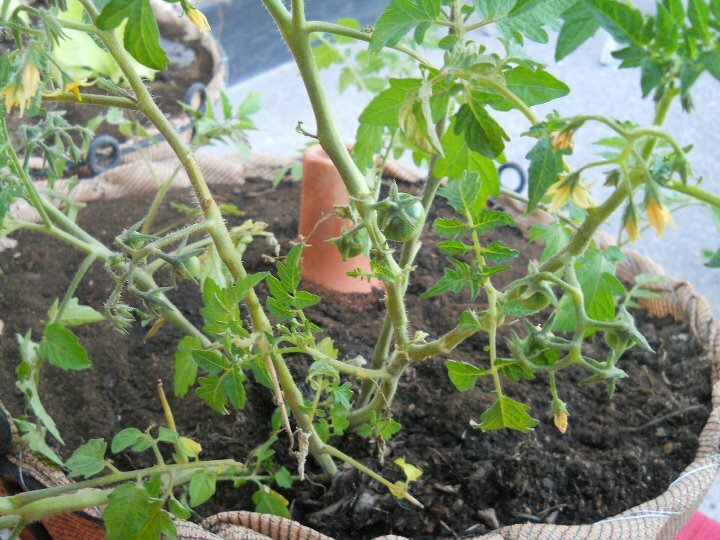 But if you don't want to wait that long for tomato season to start, skip fertilizer or so-called 'hot' compost. Save it for corn which is a notoriously heavy feeder. I mentioned this isn't a good planting month. There was that huge list of all I was supposed to get all done last month, remember? I probably didn't and you might have a few things to wrap up too. With care, it is still possible to sow beans and, for those of us with the room, corn. It's also possible to sow another planting of summer squash and if the pickle gods smile on you, more cucumbers. Some of the real heat loving veggies can be set out, like more peppers or tomato plants. If you enjoy eggplant, you might set out another plant or two at this time, they will extend your harvest. But remember these late plantings will need extra water (try to plant them in the late afternoon – and try very hard to minimize root damage when you transplant them). The problem with planting now is that the leaves can easily transpire much more water than the small root system can take up. If these plants have been growing in the same amount of sunlight that they will get in the ground, they stand a much better chance of survival. But wilted leaves the following afternoon suggest the root system is not keeping pace with the lost moisture. Unless your little darlings put on enough roots quickly, or you can do some judicious, temporary shading, your crop might not make it to a productive adulthood. With tomatoes, a little pruning of leaves from the plant will cut down on the water loss and the plant will put the leaves back on as soon as its root system can handle it. Unless the weather cooperates and you are lucky beyond all expectation, I would suggest that getting summer plants in the ground after the Summer Solstice is more likely than not, a waste of time. I have done it and won. I have done it and lost. But before you begin to plant a lot of summer stuff after June 21st or so, you might want to consider holding off for a couple of months and starting with a winter garden. In our climate, especially in that part of the west coast that gets a lot of Pacific Ocean influence, growing the cucurbits can be a challenge because the moisture in the air allows mildew to grow and kill these plants. The cucurbits are cucumbers, squashes, melons and pumpkins (which are really a squash) and they are particularly susceptible to getting mildew. It can be hard, in some years with heavy 'June Gloom' to get a good crop. There are some remedies for mildew but I haven't tried any yet. Perhaps this is year I’ll actually try a baking soda and water mixture on mildew and report back to you later. Up to now, I've simply gotten rid of the infected plant and grown another. It's usually only a hassle with winter squash which take longer to ripen, summer squash, the yellow crooknecks and zucchinis produce a lot of food quickly, so a replant will keep you up to your ears in zukes, if you don't get enough from the first harvest. Summer squash is called that because you eat it in summer. This includes all those zucchini, patty pans, crooknecks, and the squashes the British call 'marrow' and 'courgettes.' They are characterized by soft skin and will rot if you keep them around too long without refrigeration. Winter squash, on the other hand, which includes pumpkins, are so named because they can keep for many months and provide food over the winter months. It is their hard outer shell that allows them to be a part of a winter diet in a world without refrigeration and be transported easily over thousands of miles. Our ancestors relied on the keeping ability of winter squashes to hold starvation at bay. Keeping winter squashes edible for a long period of time in Southern California is a challenge because we don't have root cellars to store them in a cool and dry place. Gardeners with small gardens have trouble with most winter squashes because of the space they take up. The avalanche of ripe harvest should begin to worry you before July is halfway through. Tomatoes, eggplants, peppers, beans, corn, zucchini, stone fruits and others will begin to overwhelm a gardener. Keep the harvest coming by picking when ripe promptly and finding ways to keep the produce for later or share your abundance with neighbors, friends or send it off to a local food bank – there are many who can't grow their own food and can't feed themselves and their families good, clean (sans pesticides) nutritious meals. No one should be forced to consume 'instant' food just because they are poor. Zucchini and summer squashes are a special concern. A four inch squash on Tuesday will resemble a caveman's club by Friday and won't be as tasty and tender. Any summer squash will do that. ; only neophyte gardeners will brag about how big their zucchinis get, they get that big whenever you don't pick them in time – it's not something to brag about, but something to be embarrassed about! The ones we call 'zucchini' are the quickest to grow to laughable sizes. It's the reason for a million recipes for Zucchini Bread, Zucchini Casserole, Zucchini Lasagna. (I have even eaten a Zucchini Crumble, brown sugar, butter and cinnamon, which was pretty good as long I avoided the bites with zucchini pieces.) Once zucchini get much beyond the four to six inch size, they aren't all that tasty and begin to get woody. Harvest them early and often. Like voting in Chicago! Melons are a challenge. Cantaloupe and honeydew melons should have a wilted tendril at the stem end of the fruit and should smell ripe (read as “mouth waters when smelling”). Watermelons are much more difficult to tell; when I was twelve, one infamous melon outsmarted me, my grandfather and the judges at a county fair by winning a blue ribbon and being as green as the proverbial Martian. I only know to thump them-- listening for an almost hollow sound, to determine ripeness, and despite that aforementioned melon, I have been really good at since I was eight. One miss in almost fifty years of thumping is a better record than any baseball pitcher you can name. Cucumbers are not so much a challenge – as soon a cucumber is big enough for you, snag it. There are many different varieties of cucumber and it would be impossible to list each and every one because they come in different sizes and shapes. Suffice it to say that Japanese cucumbers and Armenian cukes are able to get quite large and still be delicious! Not so with other varieties. I know a lot of folks get goo-goo eyed about 'Lemon' cucumbers, but I don't share the love. Some say you have to wait until they turn yellow before they are good to eat. I think they are never that good no matter when you pick them and they are stupendously big and rangy plants. In addition, the smaller the fruit you have to peel, the more work it is to get it on the table. I'll go with the Japanese or Armenian cucumbers – highly productive and delicious! The harvesting of corn is another that begs a few words. The first time I saw folks in Los Angeles trying to choose ripe corn in the market, I was completely blown away! I had never seen people pull back the shuck (the leaves covering the ear) to see if the corn had filled out the cob or to see how large the kernels were. Although, I suppose if you hadn't picked it yourself, these points might be suspect. As a child on a farm that sold sweet corn all summer long, I learned to merely feel through the leaves to 'see' what was underneath. Corn sold in markets – even farmers' markets – is usually picked after it's past the optimum stage – and non-gardeners are likely to prefer it. It is a 'more = better' kind of thinking. But corn kernels that have gotten big and fat are not as juicy and not nearly as tender. Smaller, as is often the case with vegetables, is better. The tassel on a corn plant are the 'boy flowers' and the silks are the 'girl flowers.' The pollen falls from the tassel onto the silks and that causes the kernels – really the seed of the next crop of corn – to grow. Each kernel has its own silk. If you find a cob with a 'vacancy,' no kernel where there should be, that is where one silk that did not get pollinated. If you experience worms in your corn, or you fear you will although I don't know how you can see into the future, as soon as you can see silks, put a couple of drops of mineral oil in the spot where they emerge from the shuck. The worms will find that an impassible barrier and you'll have worm free corn. To harvest, feel the ear. It may take some training, but after a time, your tactile explorations will enable you to feel the ripe (and full ear). Leave the underdeveloped still on the plant. Grab the ear firmly and pull slightly out and down in one compelling motion to liberate it from the plant. The top and bottom ends will need trimming to find the actual ear in all that you have in your hand. As above, you can find it by careful touch. In this season of heat, don't neglect yourself when you are in the garden. The sun we experience today is not the same sun our grandparents faced. With ozone depletion, it is much easier to contract skin cancer, so take steps to avoid having to deal with that. I know the popular method to avoid overexposure is to slather on lots of sun screen, but I don't find that a realistic alternative for a person in the sun almost every day. In the first place, I'm concerned that all that goop eventually gets washed off our bodies and goes into the waste stream where there is no provision to deal with. It isn't one of the substances ameliorated by city sewage treatment and so flows out into nature where we don't have a clue what it does. It's just another human pollutant and no one has bothered to investigate to determine it's harmful or benign. In my world, I prefer to deal with our environment, by always assuming the safest course of action and take exceeding care not to damage the only world we have. I continue to wear long pants and long sleeved shirts even on hot days. I have several that are quite light and let the breeze flow through. It is one way to avoid harmful rays. I am as comfortable – or as uncomfortable – as the next person. Of course, I strongly suggest a hat which you see me wear daily, not only for the interdiction of the sun, but as a way of shielding my eyes and keeping cooler. Besides, a hat is the epitome of fashion! Almost all good gardeners wear them! And while we are on this tangent, consider your number one tool set in the garden: your hands. This is one set of tools you cannot replace or upgrade so it's best to take good care of them at all times. For gardeners, the feel of earth in their fingers is one of the true joys – and feeling of connection –one can experience. However, the hands can also get injured easily in a garden so take a few steps back and consider how to protect them. When doing repetitive tasks that abrade your skin, wear gloves. Have more than one pair: one for moist work that has a moisture barrier of some kind, one for light work (goatskin gloves are marvelous to the touch – they contain a lanolin that works wonders on your hand while you work) and a heavy leather pair for hard work. The goatskin and heavy leather gloves can now be replaced by some non-animal products that are almost as protective. You will find good selections of gloves from your local nursery and your local big box store, Mail order gardening companies' catalogs display the full range of gloves that are available. Never buy a glove you find uncomfortable. It will discourage you from wearing that pair as often as you might need to. Keep your gloves pinned together when not wearing them or you'll end up with a glove for one hand and another glove for the other hand, or worse, all the same hand will be missing! I use a an electric cable 'alligator' clip to which I have attached a piece of wire in an 'S' shape to slip in my belt loop – other friends use a simple clip clothespin. Find out what works for you, but have your gloves on hand (sorry) for your gardening adventures.Is your tetanus shot up to date? Talk to your doctor – this shot should be renewed every 5-10 years and you should strive to remain current. Recommendations about this, change over the years, like most other medical advice, so talk it over with your doctor to see what course of action you should take. You don't have to garden on a former dump site to be surprised by a nail or broken piece of glass. So while soil is one of the safer substances in its natural state (penicillin was concocted from a soil mold), soil in the city are often troublesome. Look at June if you want to try to plant anything, but my advice? Try to avoid planting in July if you can. It's time to cool down! At the Learning Garden we have a 4th of July Ice Cream Social and this is one of our annual favorites – I can't wait to supply the honey for this ice cream from one of my hives! Warm the honey with the lavender in a non-corroding saucepan. Taste after five minutes to check the strength of the lavender flavor and leave a little longer if necessary, until the flavor pleases you. Heat the half and half and cream in a non-corroding saucepan and whisk the egg yolks in a bowl until they are just broken up. Whisk in some of the hot cream and return to the pan. Cook over low heat, stirring constantly, until the mixture coats the spoon. Strain into a container and stir in the flavored honey. Chill thoroughly. When you are ready to freeze the mixture, remove the vanilla bean pods. Freeze according to the instructions of your ice cream maker. Another great blog entry, David. And don't forget the protective clothing that has a higher SPF than what we usually wear. It used to be expensive but has come down to something we mere mortals can afford or at least one outfit to don for those long gardening days and then toss off. I don't like using sunscreen either and this one outfit/hat have come in handy since I think I inherited more of my mothers side of the family skin than my dad- he said there was native american in there somewhere but..... Many locations have the extra SPF clothing now. Don't forget the same for the tots- we are seeing skin cancer even melanoma in all ages, all ethnicities. Protect your feet as well- I go barefoot at home and used to in the garden but no more when sun is out and blazing..... PLEASE if you don't have a water trough, remember to put out plenty of water bowels for your furry friends and for those visitors to your garden. Thank you for sharing YOUR lavender ice cream recipe. Love lavender and my yard is full of it. Use it everywhere. And used it for my youngest when the migraines came on and wanted to avoid medication. I also make rose ice cream from rose petals which you could do in your recipe above or make rose water from the petals and use the water. For those who get a craving but don't want to make your own- go to Mashti Malone's https://www.facebook.com/pages/Mashti-Malones-Ice-Cream/100861279958807 . I think WF might carry it now too. YUMMY! Next Growing Food Class: September 1, 2012!